As beautiful as a photo can be, it can only capture one view. To fully experience an architectural space, you have to BE there. New Spin 360 is a young start-up company with Vermont roots that has quickly grown to serve clients nationwide. 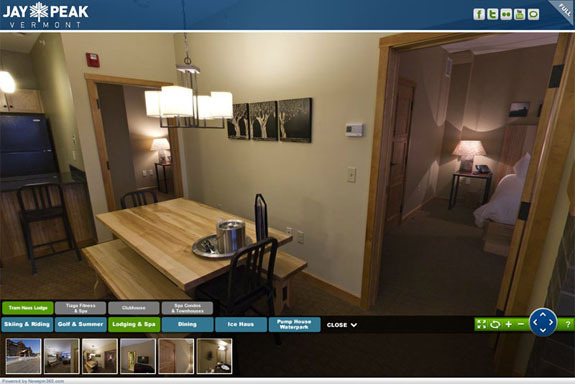 They produce interactive 360 degree photos of interior and exterior spaces that are the closest thing to being there. These are actually more than 360 degree photos, because the view extends in all directions: not only can you pan from left to right, but you can look completely up and down, and … well … all around. The effect is that you can see everything possible as if you were standing in the space. The concept is simple, and the interface is simple, but it opens up a whole new way to show off the spaces we design. 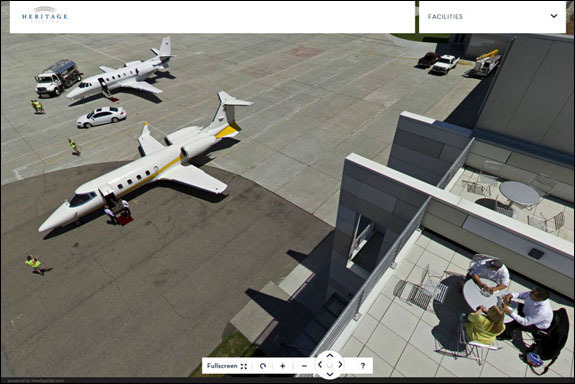 So we were very excited to see that Heritage Aviation was recently photographed by the folks at New Spin 360. Heritage Aviation is, of course, the recently completed LEED-Gold private aviation facility at Burlington International Airport. 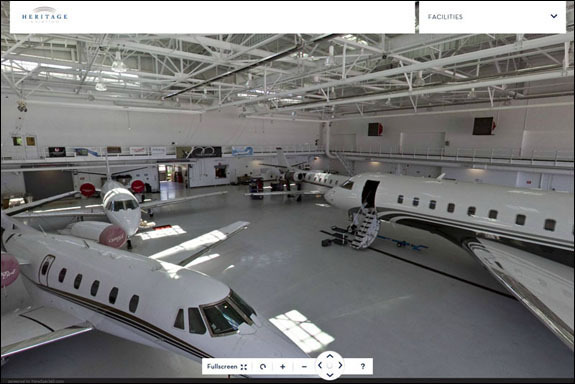 If you haven’t been there in person, you can now see what it is like to stand in the middle of the hangar, with a fleet of private jets surrounding you. Be sure to look up to see all the skylights that flood the space with natural light, sitting above the open steel webs of the original structure, all painted white to maximize reflectance and minimize the need for electric lighting. Other views are available as well. You can take a look from out on the runway, looking back toward the hangar doors. Or step up to the rooftop patio and look out across the runway. Pan to the right and you’ll see the green roof with its colorful vegetation. Now look up over the top of the hangar and you’ll see the white roof used for maximum solar reflectance, with the top of the wind turbine visible from the other side of the site. Another one of our projects that has been captured by New Spin 360 is the Tram Haus Lodge at Jay Peak. Jay commissioned a big photo shoot that included all of their new buildings, including these guestrooms that we had the pleasure of working on last year. To step inside, go to this site and click on “Lodging & Spa”. Want to see more? Check out InsideChurchStMarketplace.com for a New Spin on the summer action at the Church Street Marketplace in downtown Burlington.